The outsized daily swings in the major US equity averages tell the classic story of a bear market. Normal bull markets simply do not experience consecutive multiple daily moves of 2% or more. 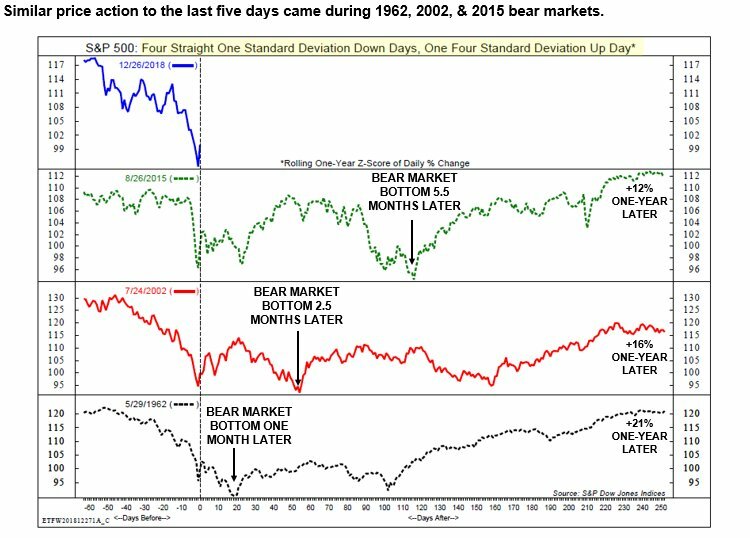 The market's panicked price action is highly reminiscent of past panics in 1962, 2002, and 2015. In those cases, the market bounced, and made a lower low several months later. In all cases, stock prices were higher a year later. My base case scenario calls for an initial low, rally, followed by choppy price action, and a final low within 6-8 months. 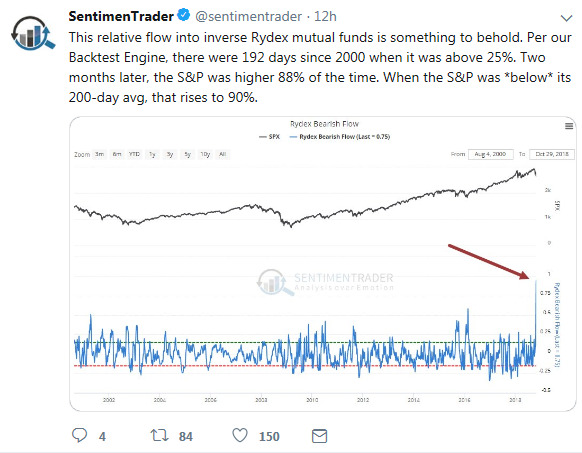 The most recent exception to this rule was 2001-2002, when stock prices cratered in the wake of the 9/11 attack, but made the final low just over a year later. Arguably, the 2002 low was distorted by the 9/11 shock, and the market made a double bottom in 2002 within the space of three months. 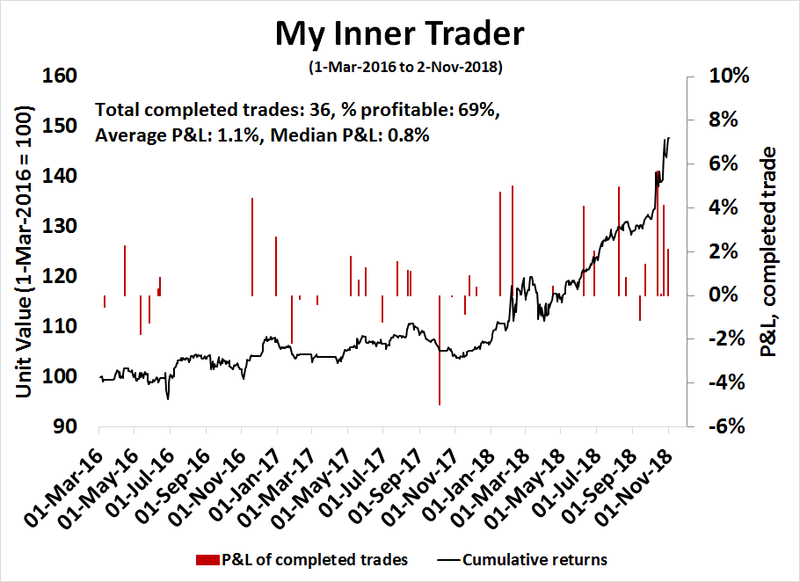 At this point, market psychology is becoming its own reality, and psychology may wind up dominating intermediate term market action. This week, I go bottom spotting as I offer a checklist of the signs of a market bottom, and try to estimate the downside risk posed by the current bear market. The year is nearly over, and it is time to issue a report card for my investor and trading models. Overall, both had good years, except for the trading blemish at year-end. My inner investor could not have asked for much more. 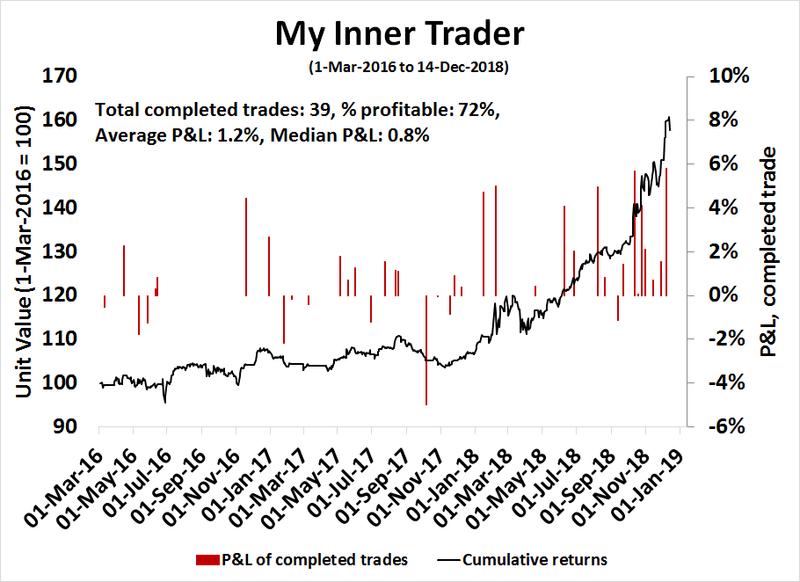 He was correctly bullish during the run-up from early 2016, and turned cautious at the January top. He turned bullish again as the market corrected in February, and became cautious again in August (see A major top ahead? 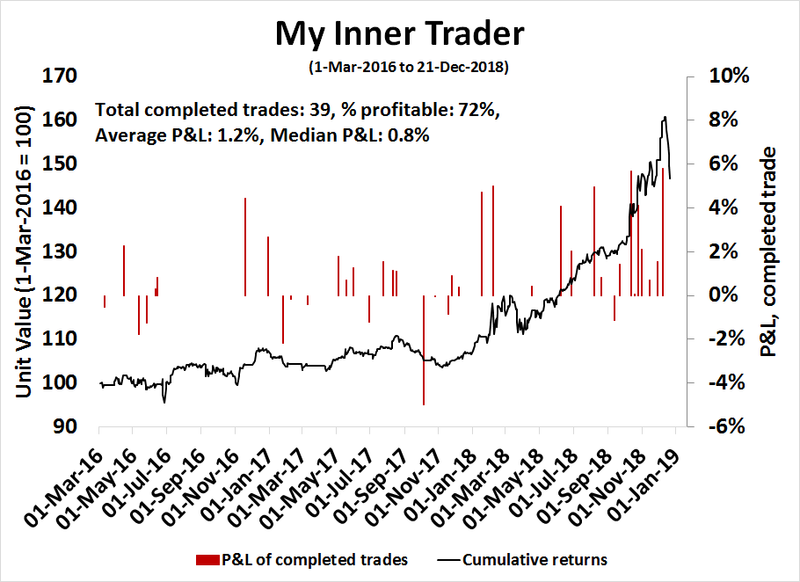 My inner investor turns cautious). I am indebted to the blogger at Philosophical Economics who suggested a macro overlay to trend following systems (see Building the ultimate market timing model). 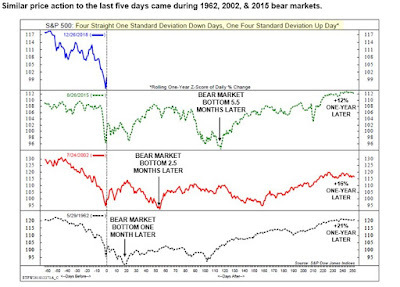 Major bear markets generally occur under recessionary conditions. Why not ignore moving average signals until your macro model is forecasting a recession? This “Ultimate Market Timing Model” is ultimately beneficial for long-term investors. 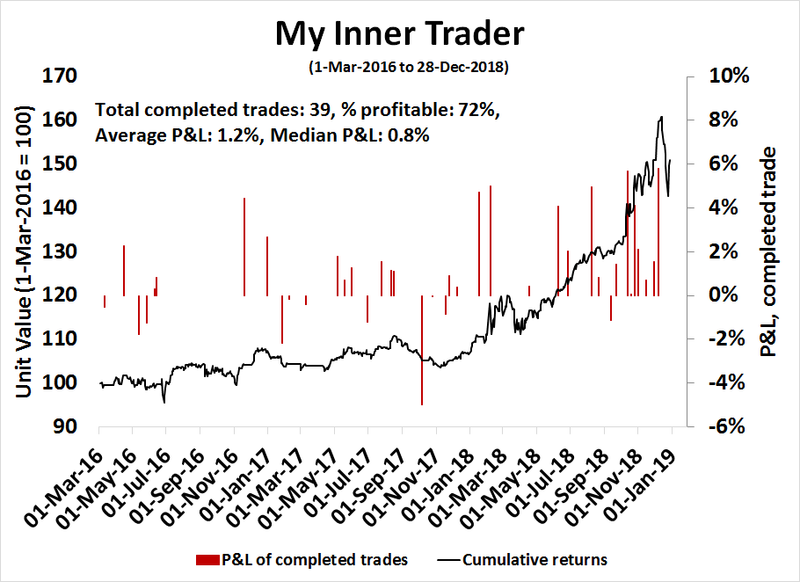 If you could cut off the left tail of the return distribution and avoid the really ugly losses, you could run a slightly more aggressive asset mix and receive a higher expected return with lower risk. For example, if the standard risk-return analysis dictates a 60% stock and 40% bond asset mix, you could change it to a 70/30 mix with this model, and get downside risk similar to the 60/40 portfolio. To be sure, this system isn’t perfect, and anyone using such a model will have to incur “normal” equity risk, and it would not have kept you out of the market in the 1987 Crash. Little did I expect the market to fall so dramatically after that sell signal, but I can't ask for much more in an asset allocation model, either on an intermediate or long term perspective. What is the market discounting? The velocity and ferociousness of the recent US equity market weakness caught even bears like me by surprise. My social media feed has been filled with extreme bearishness. Opinions are now becoming bifurcated. 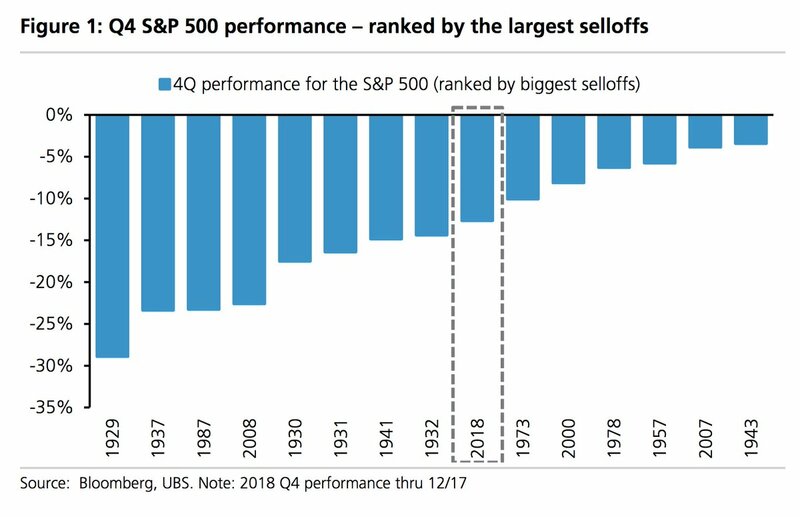 Either the decline is the signal of something big, or the fall in stock prices represent a buying opportunity for fundamentally oriented investors. It is impossible to make a buy, hold, or sell decision without some understanding of what the market is discounting. In other words, what bet are you making if you decide to buy or sell stocks here? Further analysis reveals that investors are discounting only a mild US slowdown in 1H 2019, but no recession. From a technical perspective, both the US and global markets have violated well-defined uptrend lines, just as they did in 2015 and 2007. It remains an open question as to whether the trend line breakdowns will result in just a mild pullback, or a deeper bear market. (Please note that the curves and arrows drawn on the charts are only stylized, and do not represent technical projections or targets). Mid-week market update: I had expected to begin to wind down and relax for the holidays this time of year. Instead, we got a bloodbath in the stock market. To say that the market is oversold is an understatement. 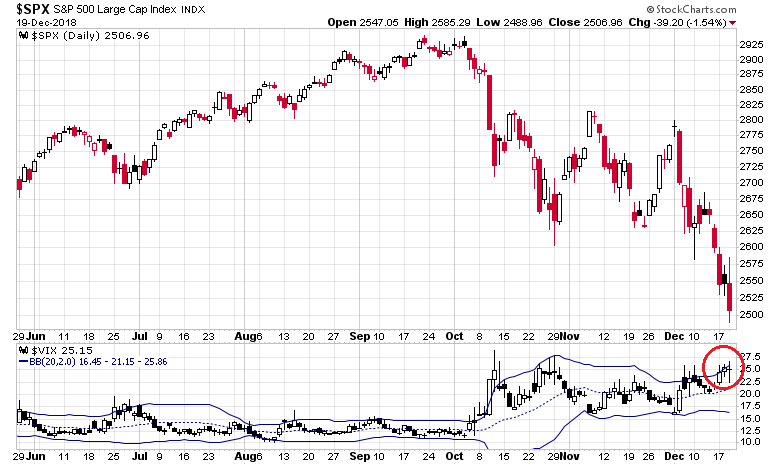 Sure, standard measures indicate oversold conditions, such as the VIX Index had risen above its upper Bollinger Band. 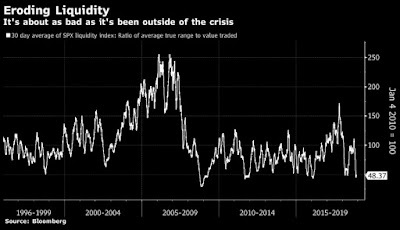 Interestingly, the VIX Index failed to rise today despite the carnage in the stock market, which could be a sign of hope for equity bulls. The Fear and Greed Index is also showing extreme conditions. 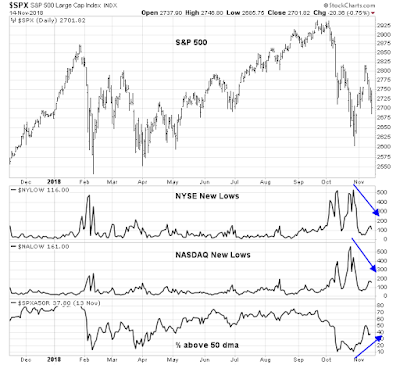 Oversold markets can become more oversold. How oversold? 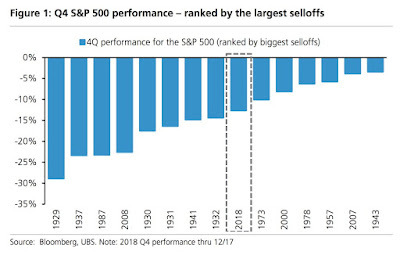 This report from UBS puts the velocity of the sell-off into context. In a past post (see Pax Americana or America First? 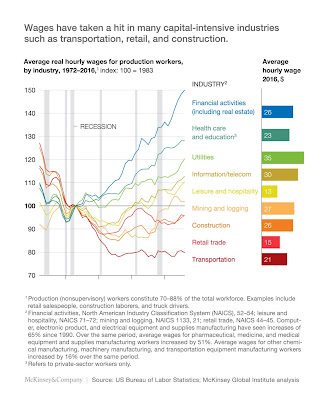 ), I showed how the combination of the unequal sharing of productivity gains and the inward looking America First policies were eroding US competitiveness, and raising the fragility of the post-WW II Pax Americana boom. Even though the US and China appears to be locked into a Cold War 2.0, I would like to demonstrate how both countries appear to be locked into paths that will eventually stall their growth. 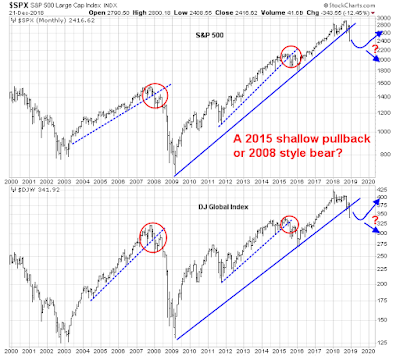 What happens after the sell signal? Last week's publication generated much discussion (see A bear market is now underway). Some of the questions related to the duration and downside target in a bear market. 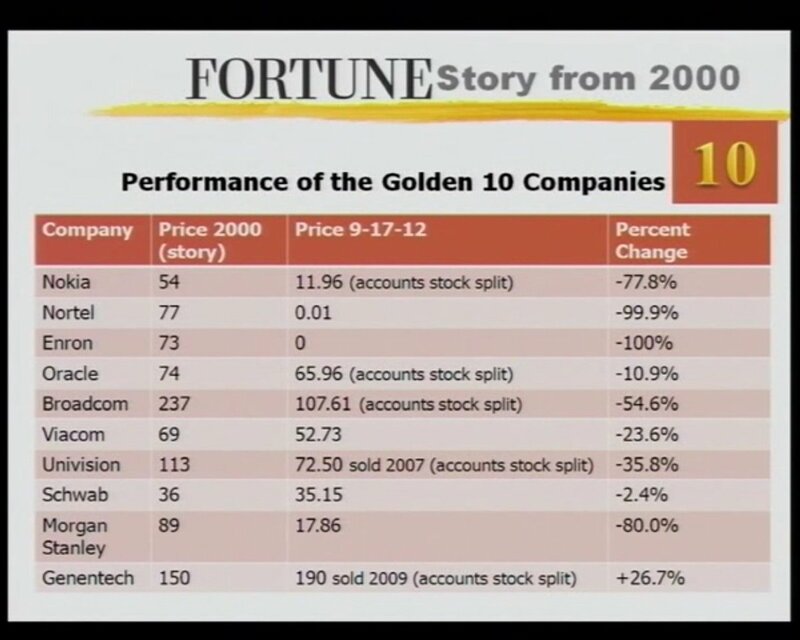 How far can stocks fall? How long will it last? What might be the trigger for a buy signal? To reiterate my thesis from last week. 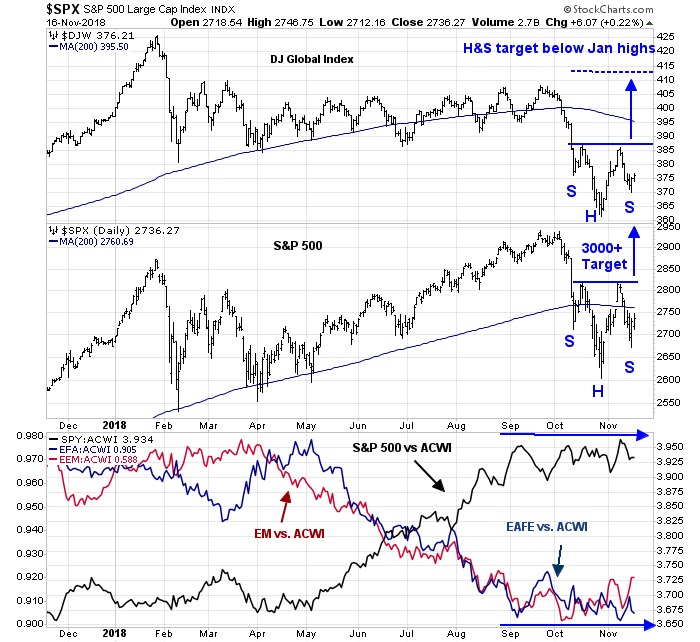 Poor technical action and a recession forecast for late 2019 or early 2020 prompted the equity sell signal. The recession forecast stems from the combination of near-recession conditions based on conventional US macro indicators, evidence of global weakness in both Europe and China, and the near certainty of a trade war which would further tank global growth. Mid-week market update: This market is becoming increasingly jittery. Indeed, the chart below shows that the stock market moves more per dollar traded than usual, indicating a lack of liquidity. 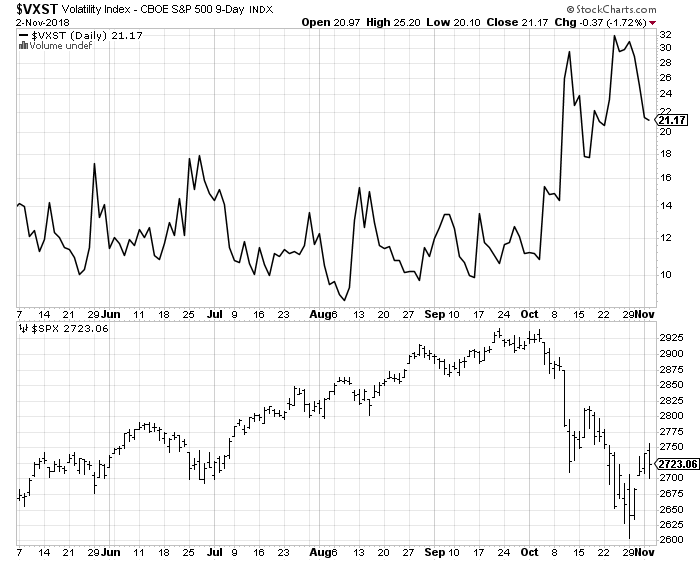 This indicates that volatility is likely going to increase. 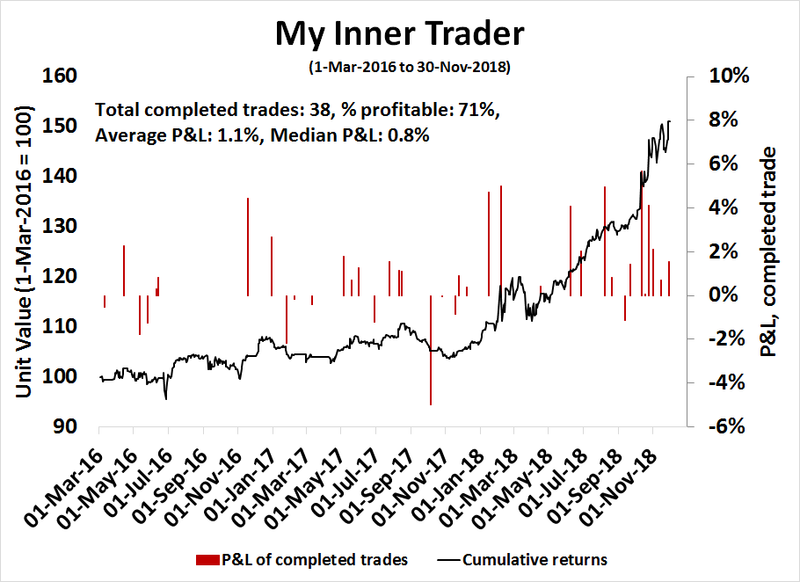 Such an environment can be both profitable and trying for traders, as I have both good news and bad news from the sentiment front. December is the season for investment advisors and portfolio managers to meet with their clients. Here are some thought on your an allocation framework as you prepare for those meetings. 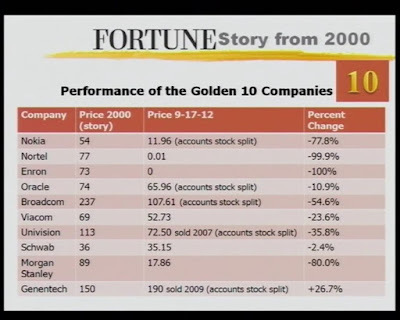 As a cautionary message, let's begin with a "buy and forget" portfolio featured in Fortune in 2000 and how they performed by 2012. Haha. Experienced portfolio managers and advisors don't make those kinds of mistakes. We all know that diversification is the only free lunch in investing. 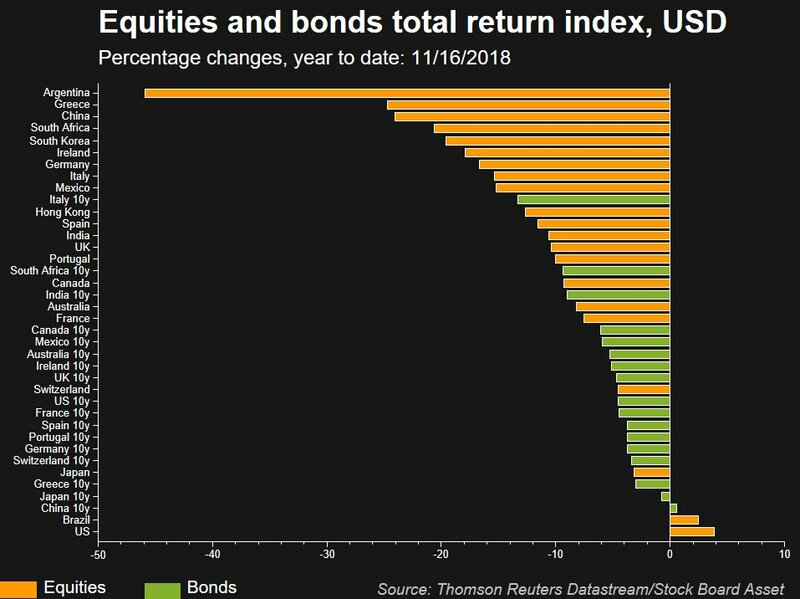 Unfortunately, I see American investors making the diversification mistake, as well as mistakes 4 and 5 again and again. Much of what passes for financial planning in the US is based on the mistaken assumption of a backtest that has severe survivorship problems. This will becoming increasingly evident as American policy changes from the era of Pax Americana to America First. I have been engaged in a running debate about the possibility of a Trump Put in the market. My friend believes that Trump is likely to pull back from a full-scale trade war with China, as it would tank the stock market and increase the likelihood of a recession. The Republicans lost the House in 2018 with the unemployment rate at 3.7%. A recession in 2019 or 2020 will not only lose them the White House, but probably both houses of Congress. Trump wants to avoid that scenario at all costs. As the stock market churned this week, President Trump anxiously called advisers both inside and outside the White House looking to ensure that his talks with China were not driving the selloff. Fresh off what he described as a historic weekend meeting with China’s President Xi Jinping, Mr. Trump has questioned why the markets weren’t reacting more positively to the news of the potential breakthrough with Beijing. In consulting with advisers, he remained convinced that the volatility wasn’t his own doing, but rather, the product of the Federal Reserve’s plan to raise the benchmark interest rate. Wall Street analysts took note of the administration’s comments this week around the trade talks. Analysts at Morgan Stanley declared them indicative of the administration’s “markets-sensitive” approach to policy-making. Is there a Trump Put in stock prices? If the market were to really tank, could a Trump change of heart on China turn the market around? Over the years, I have struggled with the problem of integrating technical analysis into an investment process. 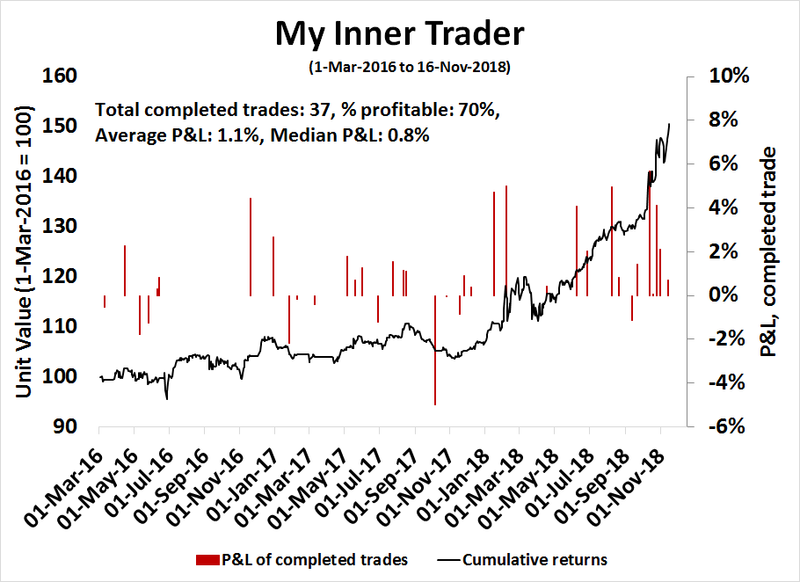 Trend following systems that employ one or more moving averages work well longer term, but they have the disadvantages of being slow (by design), and they can produce false positives which whipsaw during trendless periods. 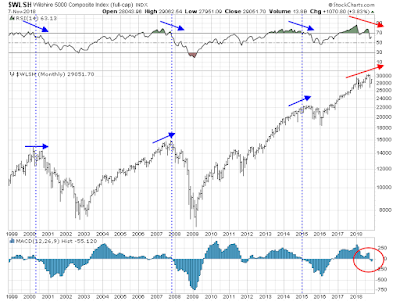 The chart below shows how a simple 200 dma as a buy and sell signal would have worked for the SPX in the last 20 years. The good news is it kept you out of major bear markets, but at the cost of numerous whipsaws, which are circled. This "Ultimate Market Timing Model" is ultimately beneficial for long-term investors. If you could cut off the left tail of the return distribution and avoid the really ugly losses, you could run a slightly more aggressive asset mix and receive a higher expected return with lower risk. For example, if the standard risk-return analysis dictates a 60% stock and 40% bond asset mix, you could change it to a 70/30 mix with this model, and get downside risk similar to the 60/40 portfolio. To be sure, this system isn't perfect, and anyone using such a model will have to incur "normal" equity risk, and it would not have kept you out of the market in the 1987 Crash. Stock prices have been weak for several months. Today, any flavor of moving average system would produce at best a neutral signal, and at worst a sell signal. At the same time, I have been maintain a Recession Watch suite of long leading macro indicators designed by New Deal democrat to spot recessions a year in advance. 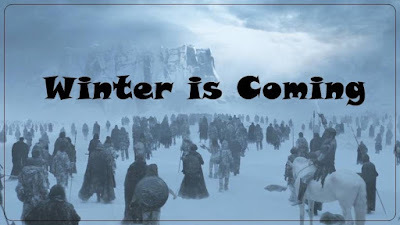 My latest review (see 2019 preview: Winter is coming) shows that the macro models are flickering red, indicating a slowdown in 2019, but I am not ready to call a recession yet using conventional macro analysis. However, good modelers also know the limitations of their models, and other factors that are not captured by the Recession Watch indicators are sufficiently negative for me to call for a recession to start in late 2019 or early 2020. The combination of weak stock prices and a recessionary call therefore changes my Ultimate Market Timing Model to a sell signal. The current drawdown for the SPX from its peak is about 10%, which represents an acceptable level of equity risk for a long-term asset allocation model for patient money. Investment oriented accounts should move to a maximum defensive posture. 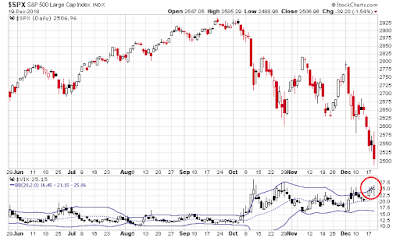 Tactically, the market is very oversold and poised for a relief rally. Investors should take advantage of any strength to reduce equity risk. Traders may want to position themselves for the anticipated advance into year-end. Mid-week market update: In the wake of the Powell speech last week and the FOMC minutes, the market implied odds of rate hikes have plunged. 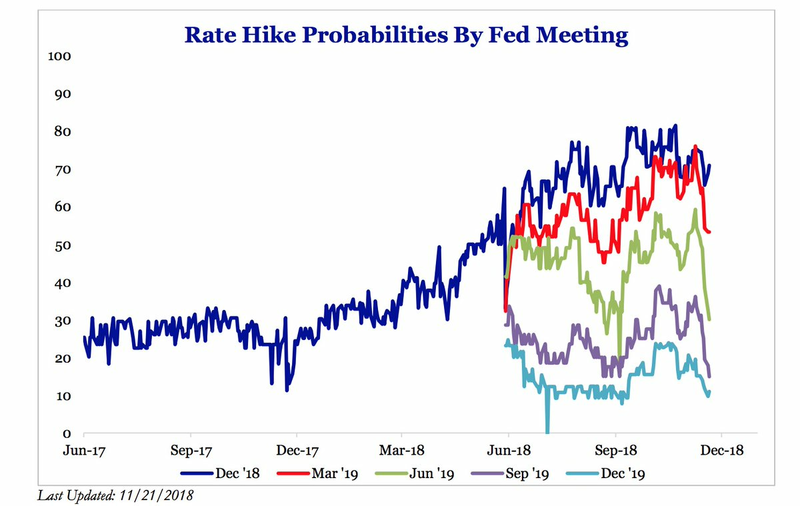 While the base case calls for two rate hikes by June, the odds of a once and done policy after a December hike is rapidly increasing, while the probability of three more hikes by June has plunged. Last week, Donald Trump tweeted his dissatisfaction with General Motors' decision to close four US plants. I feel his pain. 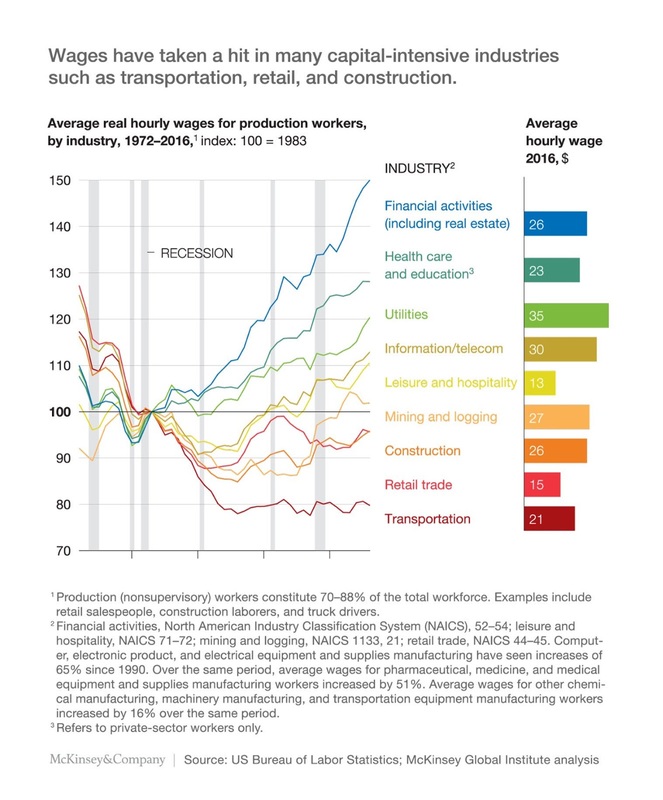 Indeed, wage growth in Old Economy industries have been stagnant for quite some time. President Trump believes he can command markets like King Canute thought he could the tides. But General Motors has again exposed the inability of any politician to arrest the changes in technology and consumer tastes roiling the auto industry. I agree. Trump's 1950's framework for analyzing the economy has become outdated. The world is moving on, and investors should move on too. The market will undoubtedly react positively to the news from Buenos Aires at the market open on Monday. Both sides agreed to a 90-day ceasefire, where the US agreed not to hold off on additional tariffs scheduled for January 1, and China agreed "to purchase a not yet agreed upon, but very substantial, amount of agricultural, energy, industrial, and other product from the United States to reduce the trade imbalance between our two countries". The trade war will be back on if both sides don't come to an agreement after 90 days. Josh Brown had a terrific analogy for the stock market, though he could not claim to be the originator. He characterized the stock market as a untrained and hyperactive Jack Russell terrier leashed to its owner, the economy. Both move in the same general direction, but the dog`s movements are far more erratic and excitable. They don`t have the same temperament and tendencies, but over time, they move in the same direction. Technical analysis can help with discerning the short-term movements of the dog, and fundamental and macroeconomic analysis gives us insights on the dog handler. Notwithstanding the results of the trade negotiations in Buenos Aires, our analysis of the handler (economy) provides ample evidence that winter is coming. 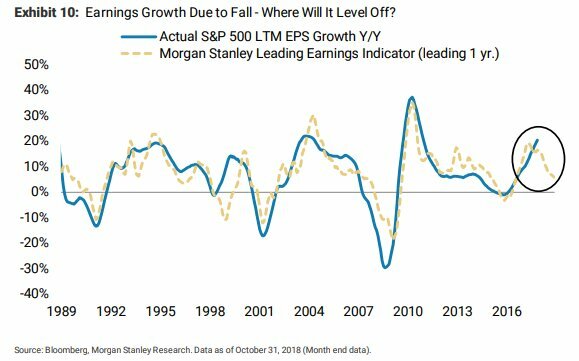 More ominous is the Morgan Stanley Leading Economic Indicator, which is pointing to a significant deceleration in earnings growth in 2019, even without a trade war. The only question is whether it will be a mild or harsh winter. 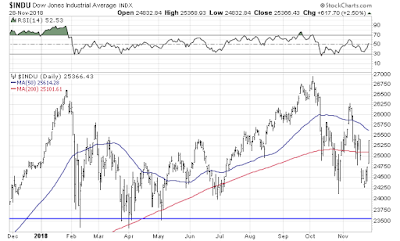 A Dow Theory sell signal? Mid-week market update: I suppose that this may sound counter-intuitive now that the market is undergoing a relief rally, but Ralph Acampora warned about a possible Dow Theory sell signal about two weeks ago should the DJIA decline to break its March lows. 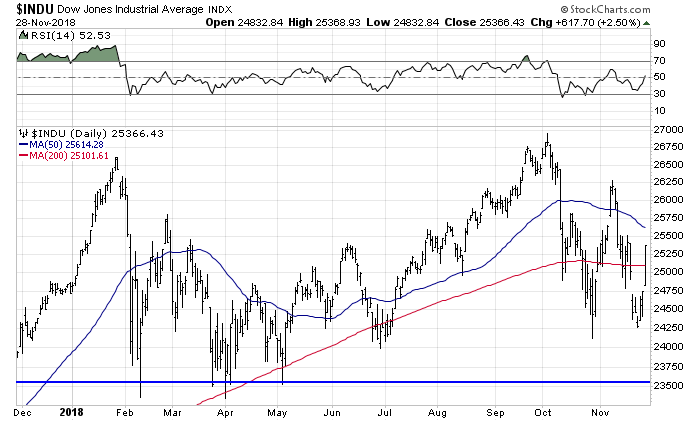 What are the odds that the Dow will test its March lows, or break them to flash a sell signal? Is the Powell Put coming into play? Is the Fed about to blink? There has been a growing chorus of analysts like Kevin Muir at The Macro Tourist who thinks so. What broke? Muir mentioned a number of possible triggers. First, there is the dire picture of global asset returns this year. Political pressure from the White House (the WSJ reported that Trump expressed displeasure with Treasury Secretary Steve Mnuchin for his recommendation of Jerome Powell for the position of Fed Chair because the Fed's tightening policy). As a result, the trajectory of Fed Funds expectations has collapsed. The Federal Reserve had previously been plugging their ears and telling the global financial community nah-nah-nah-we-can’t-hear-you-we’re-going-to-keep-raising-come-hell-or-high-water, but the economic and financial market weakness that was previously confined to the rest of the world, has finally come to America. The Federal Reserve is now very close to being on hold for the indefinite future. Sure, they will probably raise once more this December, but it’s most likely a one-and-done. Or at very least, much more a one-and-we-will-see. Does this mean the Powell Put is coming into play? Callum Thomas has a terrific chart depicting the scope of the global stock market weakness. At the end of October, roughly 13% of global indices were above their 200 day moving averages (dma). Such readings are normally seen at intermediate term lows, or as part of a broad based bear market. If this is indeed an intermediate low like 2015, or even 2011, investors should buy with both hands. On the other hand, if this is the start of a recession-induced bear market, investors should continue to de-risk their portfolios. Right now there doesn’t seem to be one big thing setting us up for a crisis – not like the housing bubble before 2008, or the tech bubble of the late 1990s. But there are several smaller things: trouble in emerging markets, some softening of housing, commercial real estate, corporate debt. So we could have a “smorgasbord” recession like 1990-91, with several factors coming together. This could be a problem, because interest rates are still low and there’s not much room to cut. Could we see a "smorgasbord recession" in the near future? I normally don't comment on individual stocks because I don't have the resources to analyze a zillion companies in detail, but here is a Black Friday thought on Apple, which kicked off a revolution in consumer electronics and created new product categories when it unveiled its iPods, IPads, and iPhones. The share price of Apple have cratered on reports of poor iPhone sales. The chart is a bull's nightmare. It broke down through the 190 key support level, and violated a long-term uptrend. In some ways, AAPL is turning out to be a Rorschach test for investors and traders. Mid-week market update: In light of the US holiday shortened week, I thought I would do one of my periodic sector reviews to analyze both sector leadership and the implications for stock market direction. As a reminder, Relative Rotation Graphs, or RRG charts, are a way of depicting the changes in leadership in different groups, such as sectors, countries or regions, or market factors. The charts are organized into four quadrants. The typical group rotation pattern occurs in a clockwise fashion. Leading groups (top right) deteriorate to weakening groups (bottom right), which then rotates to lagging groups (bottom left), which changes to improving groups (top left), and finally completes the cycle by improving to leading groups (top right) again. The latest RRG chart shows the defensive sectors firmly in the lead, while technology, which were the former market darlings, mired in the lagging quadrant. While current leadership provides a useful snapshot of the current market, it does not tell the entire story. In a speech last week, Fed chair Jay Powell stated that while the American economy was performing well, he raised concerns about the effects of a global slowdown. His remarks highlights the importance of non-US markets, and it would be useful to take a brief tour around the world to see what Mr. Market thinks of the "global slowdown". A comparison of global equity market (top panel) and US equities (middle panel) shows some differences and similarities. 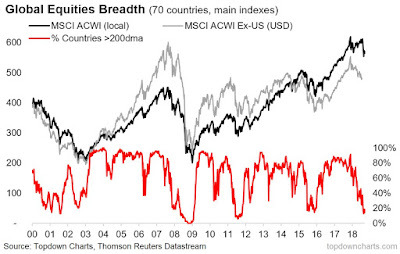 Both global and US equities are in downtrends, defined as each index trading below its 200 day moving average (dma), but US stocks are stronger as the SPX is only just below its 200 dma. Both indices are forming possible inverse head and shoulders formations which may resolve bullishly. As good technicians know, these patterns are not confirmed until the neckline breaks. One key difference stands out if upside breakouts were to occur. 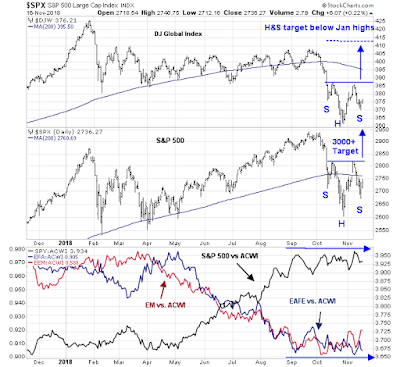 The measured upside target for global stocks is below the January all-time highs, while the measured target for the SPX is over 3000, which would represent a fresh high for that index. Market leadership may be pausing and waiting for direction. 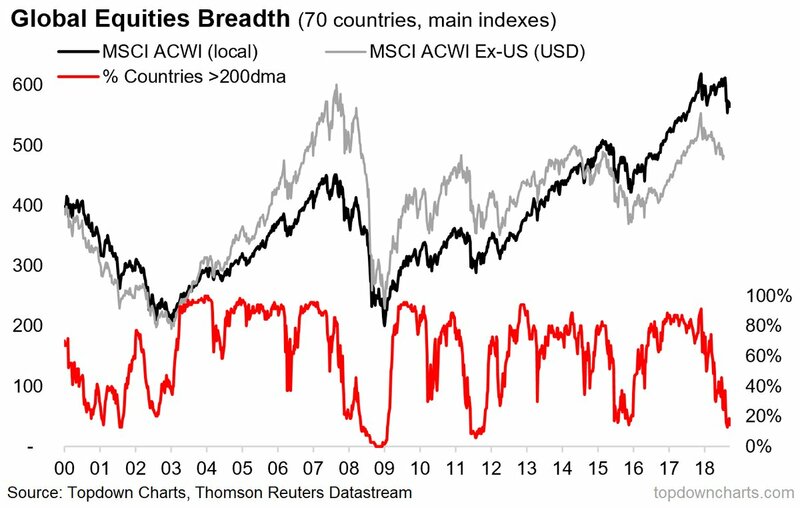 The bottom panel shows that for much of this year, US stocks have been outperforming global stocks, as measured by the MSCI All-Country World Index (ACWI), but relative performance of US, EAFE, and EM equities have flattened out since September. What follows is a more detailed review of global markets as we take a quick tour around the world. Mid-week market update: Even as stock prices weakened this week, the market appears to be setting up for a year-end rally. 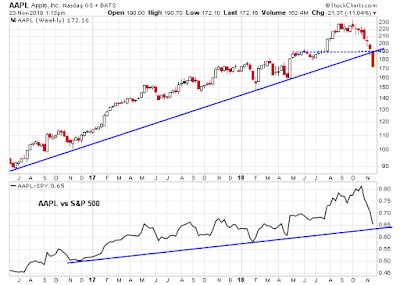 The SPX is exhibiting a number of positive divergences. 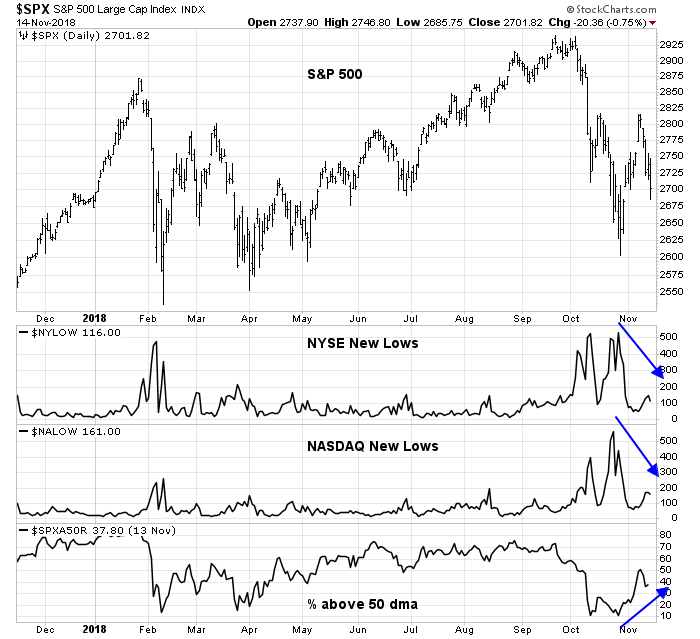 Both the NYSE and NASDAQ new lows are not spiking even as stock prices have fallen. In addition, the percentage of stocks above their 50 day moving averages (dma) are making a series of higher lows, which are all bullish. What are the risks and opportunities in positioning for a year-end rally? In the past week, a number of readers have expressed the conviction that US-China trade tensions are likely to ease in the near future at the upcoming Trump-Xi meeting, which will occur at the sidelines of the G20 meeting November 30-December Bloomberg reported that American farmers are so hopeful that they are storing significant amounts of their soy crop for future sale. What are the odds that will happen? Certainly, there are some signs of a thaw. The strength of the USD Index indicates that there is more room for CNYUSD to decline further. But the PBOC dropped a pledge to allow the market to play a larger role in setting the exchange rate in its latest quarterly monetary report, which is a signal that the central bank is prepared to intervene to cushion yuan weakness. While the steps taken by the PBOC is a useful start, here are the challenges facing an agreement on a trade deal. 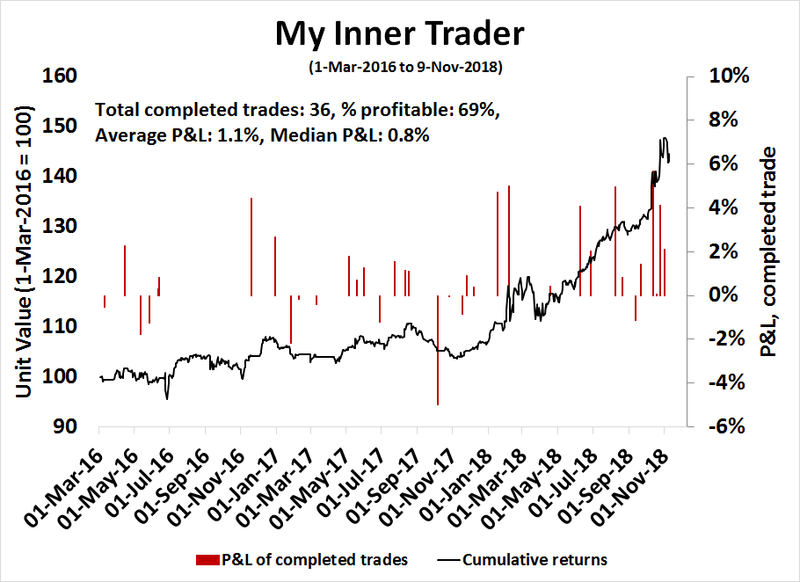 On the other hand, the latest report from Open Insider shows that corporate insiders, who are known as "smart investors", have been buying the latest dip. Historically, sales (red line) exceed buys (blue line) by a significant margin. A funny thing happened during the latest correction. Sales dried up, and buys exceeded sales, which is an indication that insiders are showing confidence in the share price outlook of their own companies. Mid-week market update: The midterm election performed roughly as expected. The Democrats regained control of the House, and the Republicans held the Senate and even made some gains. Is this bullish or bearish for equities? It depends on your time frame. Here is my outlook from a strictly chartist's viewpoint, starting with the long-term to the short-term. 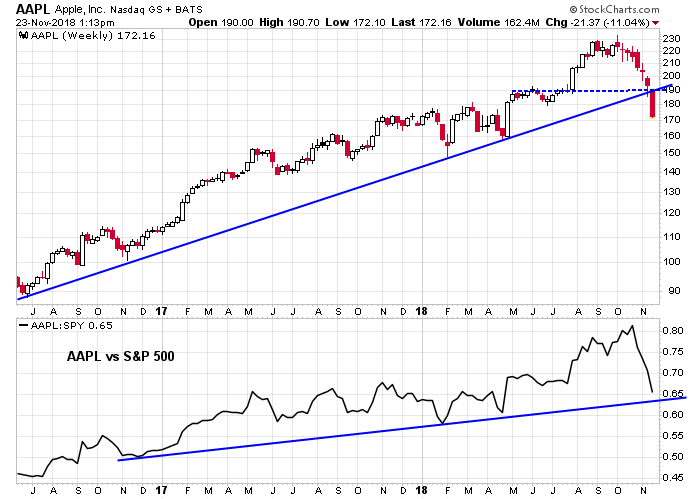 From a very long-term perspective, the negative monthly RSI divergence and MACD sell signal is too worrisome to be ignored. 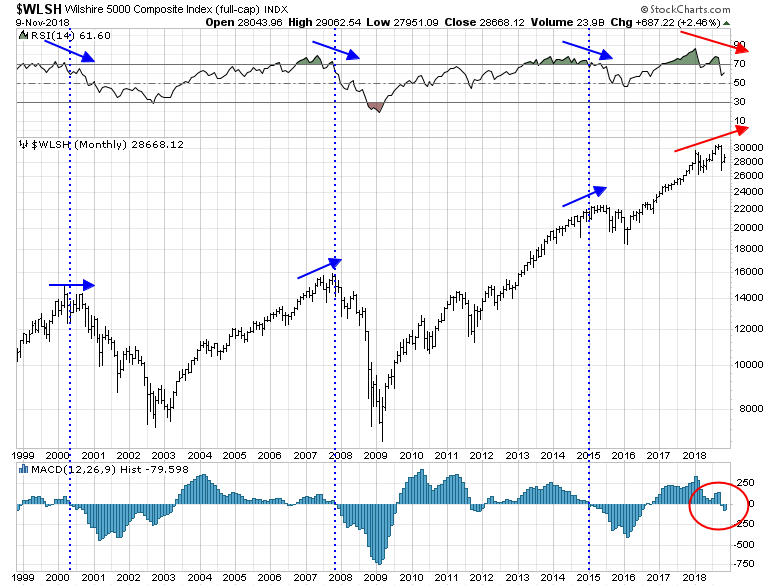 These conditions suggest that the market is making a broad-based top. 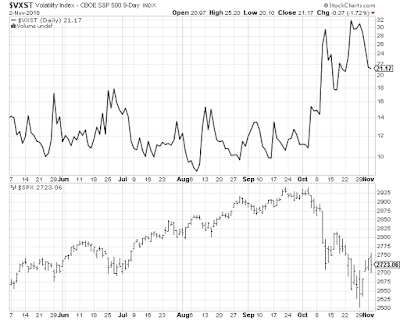 The CBOE Short-Term Volatility Index (VXST) measures volatility over a 9-days. In effect, it's the 9-day VIX, which measures 1-month volatility. VXST closed at 21.17 last week. indicating that the market expects an annualized volatility of 21.17% over the next 9-days. 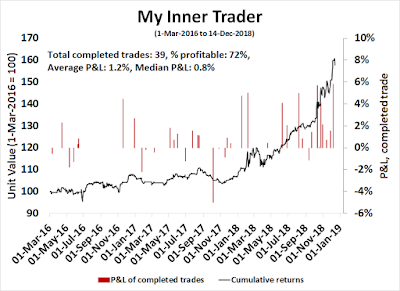 When I translate that to a weekly volatility by taking the 52nd root (52 weeks in a year), it comes to 1.1%. That figure seems low for several reasons. First, the SPX rose 2.4% last week and its low to high range was 5.9%. The midterm elections on Tuesday could pose an unknown event risk. As well, we have an FOMC meeting on Wednesday and Thursday, which could also shake up markets. The higher than normal probability of disruptive events creates fat tails for market returns. Fat tails could mean fat profits for traders. A made in China selloff? There is a family joke in our household that Santa Claus doesn't live at the North Pole, but in China. That's because everything he bring says "Made in China". There have been many explanations for the recent market swoon, such as rising rates, earnings disappointment, or earnings growth deceleration from the fading effects of the tax cuts, and so on. 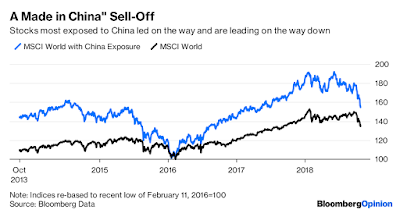 John Authers, who is now at Bloomberg, pointed out that the recent sell-off may have been made in China. Volatility returned to U.S. stocks again Monday afternoon. This is still, I think, largely about forced sellers as speculators such as hedge funds get used to the reality of having to operate with less leverage. But it would be wise to note that there is obviously a Chinese component to this. 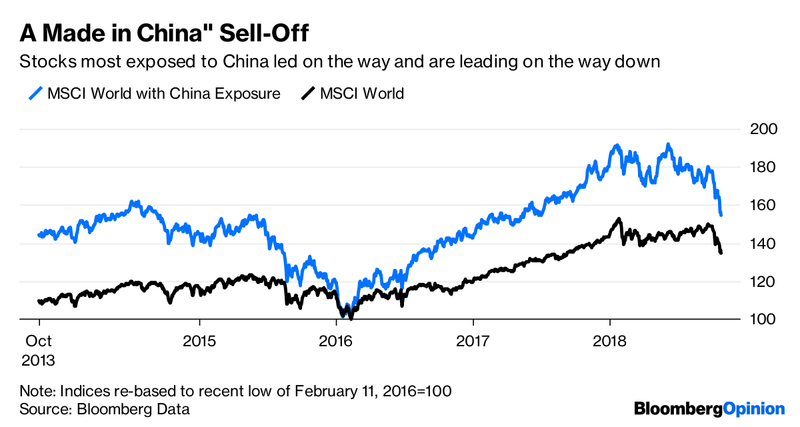 Since 2016, the more a company was exposed to China, the better it had done. But that has all changed in recent weeks, and those companies are doing worse. It's starting to look that way. After Trump tweeted about his "good conversation" with Xi Jinping, and Bloomberg reported that he asked his cabinet to draft a possible deal with China (what have they been doing all along? ), global markets went full risk-on Thursday night. Stock prices reversed themselves Friday after White House officials denied that there were any cabinet preparations for a trade plan with China. The market partially recovered when Trump contradicted his staff and stated that he thinks the US will reach a trade deal with China. If the Made in China thesis is correct, investors need to adjust the macro, fundamental, and technical analytical framework from a purely domestic focus to one more global in nature. This week, I explore the underpinnings of this hypothesis, and the steps to take should it be correct. 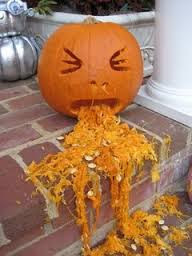 Mid-week market update: Will investors get tricks or treats this Halloween? Long time readers know I am not known for my sunny disposition when it comes to markets. 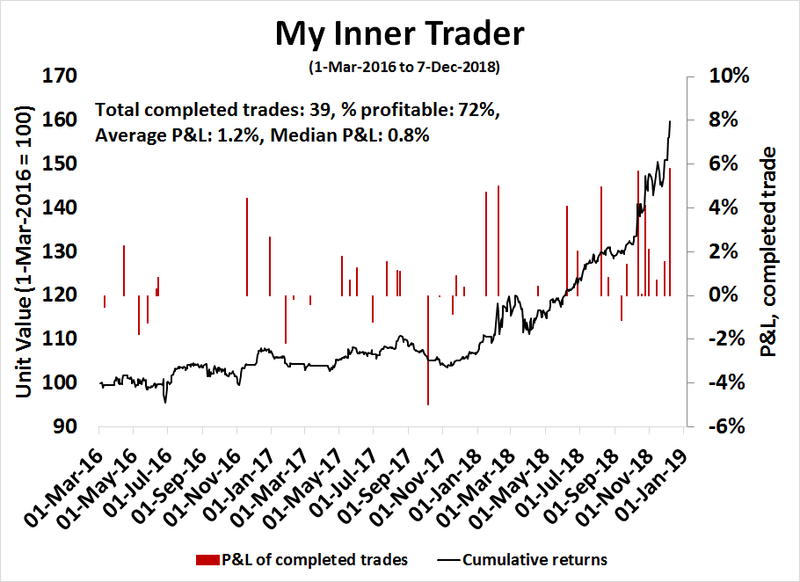 I am a contrarian; when we're going up, I look for what can take us down and when we're going down I look for what can reverse us back up. But it struck me when I took the mute off the television on Monday how really bearish everyone was. All of a sudden no one is interested in buying the dip. No one is even interesting in "picking." All of a sudden everyone is talking about at least a revisit of the February lows or more. Remember when there were targets on the upside of 3,000 or 3,200? Now I see 2,300 or 2,200 coming out. We might get there but I find it fascinating that many of the new found bears all of a sudden want to buy the market lower. 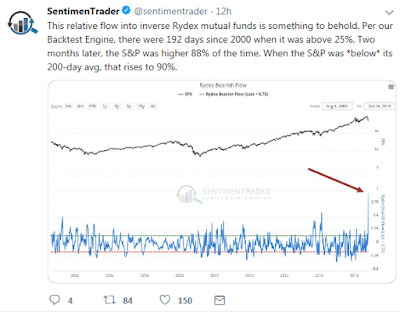 SentimenTrader also observed that flows into inverse Rydex mutual funds have gone off the charts, and such readings have tilted heavily bullish historically. Here is the bad news. Despite the two-day snapback rally, my models have flashed two long-term sell signals.